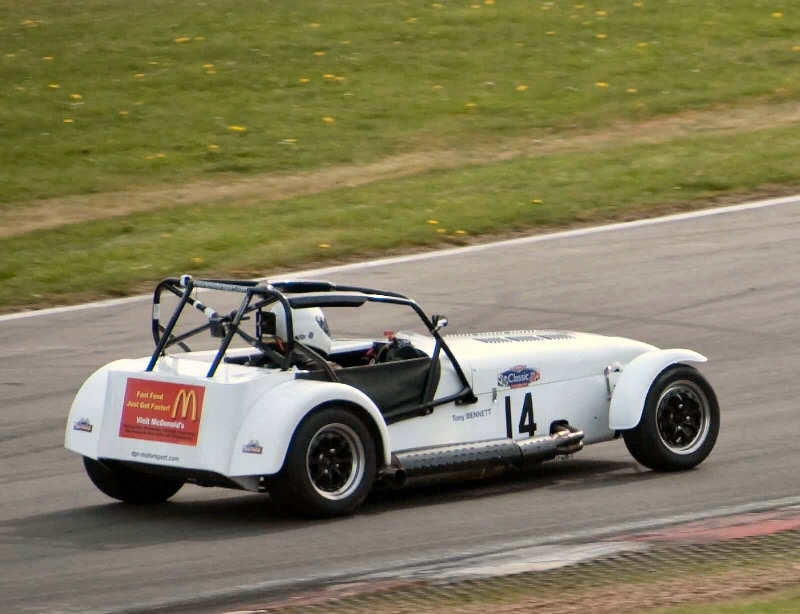 Driving an uprated Caterham Superlight R300 on the new Avon ZZR tyres, Tony Bennett achieved third in class B at the Magnificent Seven race at Brands Hatch. This car has been upgraded by DPR Motorsport to 200 bhp (175bhp standard) using the Caterham Stage One roller barrel upgrade accompanied by a new Caterham developed ecu map. Tony Bennett ran in class B and came third in class with a lap time of 52.423 seconds - the class winner had a lap time of 51.585 but was driving a highly tuned 1,800 cc K series. Second in class was a Hyabusa engined 1600. Jonathan Packer driving a standard R300 came 5th in class with a fastest lap of 52.631 and both drivers beat a number of the on-paper more powerful Caterham 1,800 K series engined R400 (14 cars ran in class B) demonstrating the much enhanced on-track performance delivered by the R300 in standard form and also what can be achieved with a relatively modest power increase combined with the new Avon ZZR tyre.